If you thought Bangkok is a place for 18+, where you can turn around with your best buddies, let me give you 10 best things that are meant for kids to do and enjoy the city as much as you can. Bangkok has something in store for every child: from witnessing butterflies to exploring the underwater life, your child will get ample amount of choices to choose from, to enjoy this rich city. An exciting boat trip on the Chao Phraya River and lots of shrieks at a water park are sure to make their day. Come and meet some of the world’s unique marine creatures at the SEA LIFE Bangkok Ocean World (formerly Siam Ocean World), situated two floors down the flashy Siam Paragon shopping mall. This one is Asia’s largest underground aquarium that displays over 30,000 inquisitive looking water creatures. The aquatic wonderland is awesome with size of almost three Olympic swimming pools with a wide array of interesting animals. 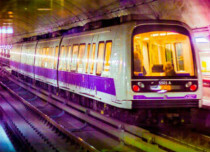 Most of the creatures are transported all the way from the Amazon River or the Jurassic period. 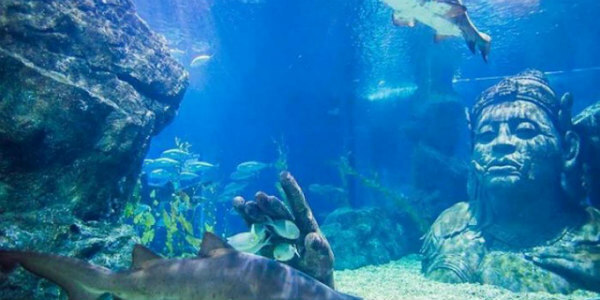 Have a nose to nose with some of the deadliest predators in the 270-degree underwater tunnel and if you want, take a dive in and swim with some sharks and rays. If you think, this is all, better rethink. You can also enjoy the virtual environment of the sea creatures created in the 4D theater, the first of a kind in Bangkok. This state-of-the-art technology will surely get you goosebumps. Permission is restricted to children below 3 years. Tickets can be purchased online at least 24 hours prior to the show. The Bangkok Ocean World is open from 10:00 - 21:00 daily. 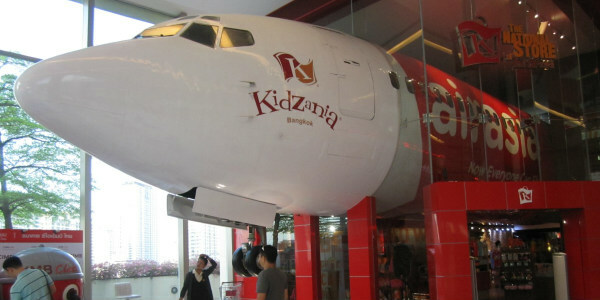 The very latest and most innovative efforts made by Bangkok to lure kids is Kidzania. This is an edutainment zone for your kids. The level of fun and education combined has been scaled up to a next level. Each and every shop and buildings in Kidzania town is a learning experience for children from four to 15 years old. Almost all the activities involve small groups of 6 to 8 kids where no parents are not supposed to interfere or participate. From lessons on how to change your dad’s car tires to learning firefighting and cooking, everything is taught here. The best part is that your kid can even earn his/her own 'KidZos' money by doing these small so-called jobs. Further, you can even open the bank account for the same at CIMB bank. 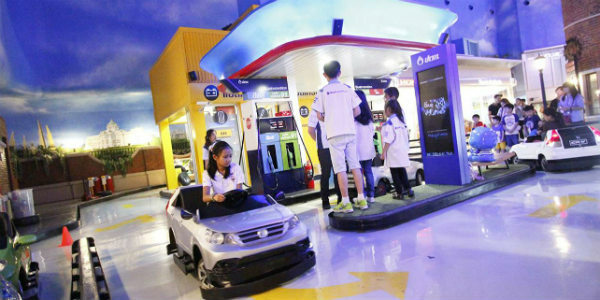 The Kidzania is open on weekdays from 10.00 - 17.00 while , weekend and Holidays timings are from10.30 - 20.30. 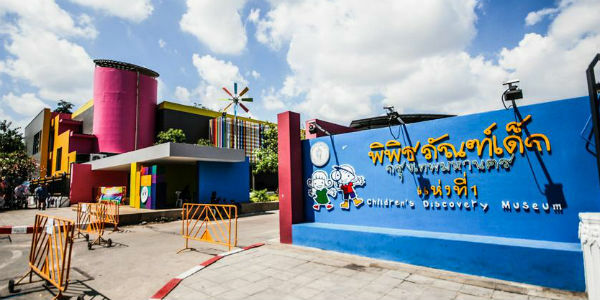 During weekdays the tickets to visit this edutainment center is fixed at 425 Baht for adults and toddlers while people under the age of 15 years can pay 850 Baht to be here. During weekends and Holidays, the ticket prices for adults and toddlers is 500 Baht while for Kids, it is fixed at 1,000 Baht. On the third floor of Emporium Mall is the Imaginia Playground which focuses to educate and entertain kids. The concept of Imaginia is to empower learning through playing. The activities that children can take part in includes art, music, literature, technology and strategic thinking. The activity center is well suited for children below 15 years of age. The play center is open daily from 10:00-20:00. However, it is advisable to visit during weekdays. Three-hour day passes are available at 480 baht for kids above 91cm, 250 baht for 71-90cm and 100 baht for little ones under 70cm. Parents or guardians over 15-years-old pay 200 baht. An extra gift for kids who dream of being pilots when they grow up, for kids who have a passion to fly. This simulating flying experience is worth witnessing and is close to experiencing the so-called realistic feel of flying a Boeing 737. Prices for a Boeing 737 simulation for a 30-minute flight will cost you around 4550 baht, however, a 60-minute package would cost you 6900 baht. The arrangement made for flight simulation is very specialized and the session which is controlled by genuine pilot makes the whole experience incredibly realistic. You can choose from 24,000 airports to take off from. The audio and visuals are incredible that you actually feel as if you are flying the plane. 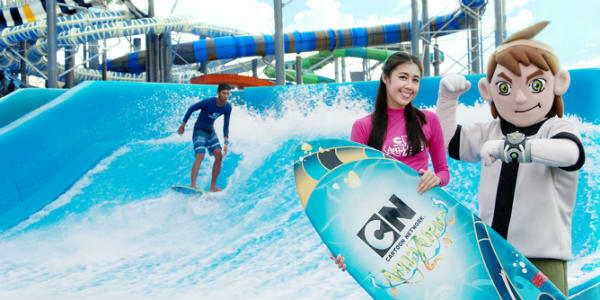 If you love surfing, you can fulfill your desire here at Bangkok as well. Amidst the heart of the city is situated Flow House which is an artificial wave machine and beach club where you can try your hands at surfing. The venue is one of the great ways to enjoy and have a fun-filled evening with your family, friends and of course with your kids. This would certainly be a new learning experience as your kids can simply jump into the inflatable ramp which is a combination of surfing and wakeboarding. Experienced staff can even guide you for surfing and will advise you regarding your posture encouraging you as well. People who are young at heart are always welcomed at the Flow House Bangkok. How about going back to the prehistoric era of those huge reptiles, Dinosaurs. 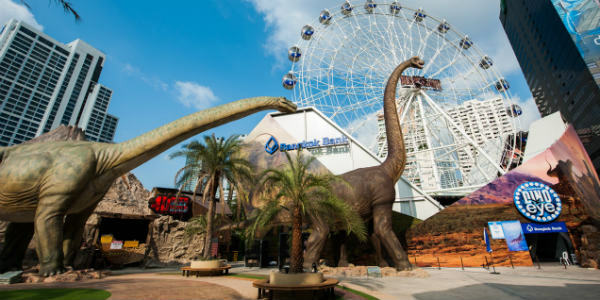 The Dinosaur Planet theme park is designed to take you to a ride back to their time. From the roaring T-rex to packs of Velociraptors to Theropod and Sauropods, more than 200 life-size models of dinosaurs can be found here. Due to the impressive construction and maintenance of the park, you can click some of your unforgettable memories here along with these huge reptiles from the lizard family. Moreover, the dinosaurs are placed in different terrain thought to be their natural habitat many millennia ago, along with a centerpiece volcano. Snow in Bangkok! Does that sound unrealistic? 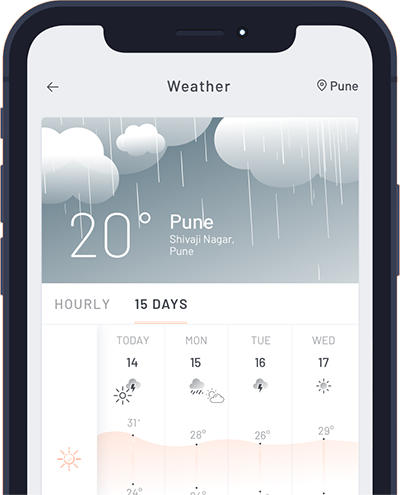 A city that enjoys the equatorial temperature almost all throughout the year, how can one glimpse of snowfall in such a region. This incredibly unrealistic assertion is true and the credit for bringing this implausible thing to reality goes to Snow Town Bangkok which is an indoor themed village and play area. The area is covered with 30-40 cm of artificial snow at the Gateway Ekkamai shopping mall. You can even find plenty of Japanese restaurants and shops there. 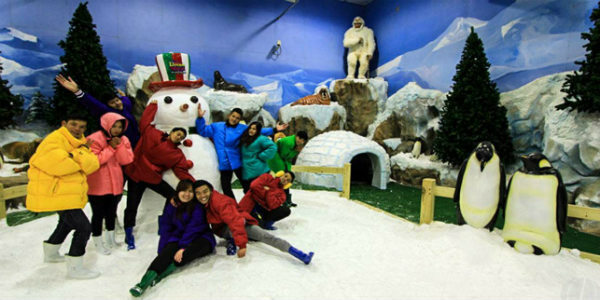 Snow Town Bangkok is an indoor themed village and play area with 30-40 cm of artificial snow located in Gateway Ekkamai shopping mall. Inside the air-conditioned hall, there is a Main Street with Japanese restaurants, shops, and a playground. You can even find modest slope with sleighs and skis on rent so you can visualize yourself being in those mountains. People over 90 cm need to pay 100 baht while 80 baht is fixed for children less than 90cm tall as the ticket fee. You will have to pay an extra 100 baht to enter to the Snow Playground per 30 minutes. For buying winter gear including jackets, gloves, and snowshoes, an additional fee is required. Further, a 55-minute skiing lesson costs from 600 baht for a group or 3,400 baht for a private lesson. Also, artificial snow machine pumping out fresh snow at short intervals is also a must watch. This happens four times a day at 12:00 (11:00 on weekends), 15:00, 18:00, and 20:00. The temperature of the hall is maintained at 15 degree Celsius to avoid being excessively cold. If you are an adventure loving person and so are your kids, then they would for sure love the Safari World which is like any other animal park but different from the typical zoos. 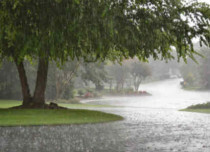 This is the perfect place to stay up close and observe some of the wild animals passing by just so close to your cars. You can easily drive through in your car or in the park bus to have a close encounter with these animals. 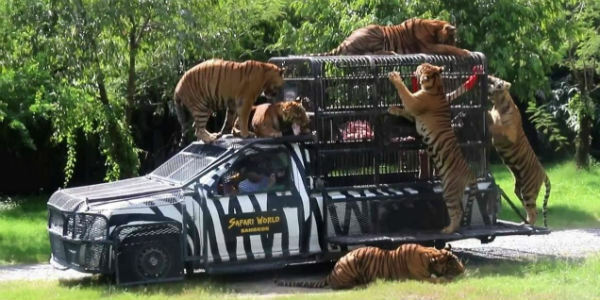 The Safari World has devoted 480 acres for the open zoo and 180 acres for its bird park, and finally, the Marine Park which is a blend of many animal shows, lots of eating stalls and plenty of souvenir shops. 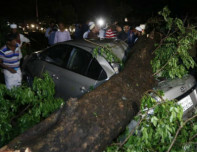 You have to have good time saved for this trip as there are approx. 7 animal shows showcased at the Marine Park. You can also spectate a western cowboy stunt show, 'Spy War', a Hollywood-like performance with explosions so loud they can be heard across the entire zoo. The Safari Park is open from 9 am to 5 pm while Marine Park opens from 9 am to 6 pm. 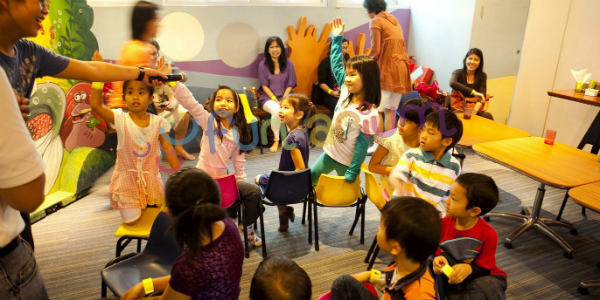 Bangkok hosts a varied array of fun and educational activities that are meant for your little ones to stay engrossed and busy. The edutainment activities includes digging up dinosaur bones in the archeological site and creating giant bubbles from the inside, learning about construction and much more. Located in the north of the city near the famous Chatuchak Weekend Market, the Museum can be easily travelled to from the BTS Skytrain till Mo Chit or MRT to Kampangphet. Then, it’s hardly few steps away from there. The museum stays open from 10 am till 4 pm all days and the best part being the entry is free for its visitors. 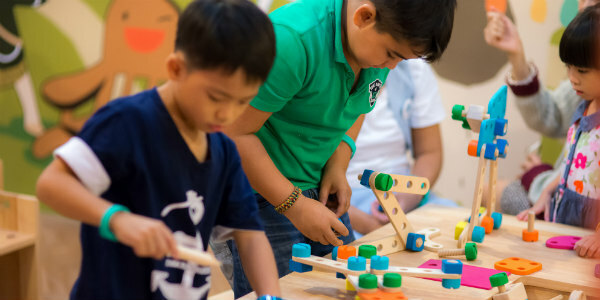 Bangkok's Children Discovery Museum inspires a hands-on approach to learning; with interactive displays, it calls on a 'discovery learning process'. Kids love to play and aquarium indoor playground is apt and a must visit place if you want your kids to return home happy. Here you will find 2,000 types of activities to involve your kids into. Large climbing structure, little kid’s soft play, sand and water area, as well as an arts and craft center and baking station, a mini flying fox to swing around like Tarzan or Jane, your kids are never going to get bored here. To satiate your hunger, a cafe area, is also available. The entrance fee depends on your size and time you spend, 200 baht is fixed for three hours for kids measuring up to 105cm, 320 baht for kids over 105cm and up to the age of 13. Adults and kids over 13 would need to pay 110 baht. Wearing socks is a must to run around and enjoy in this indoor playground although, you can get one for around 75 baht. Located on Sukhumvit, the funarium is open every day from 9:00 until 19:00. So if you were till the date of the belief that Bangkok is a bachelor's paradise, not appropriate for kids, you need to rethink and plan a visit to the city of angels with your family and don’t forget to take your kids along too.